Wolfe Industrial’s new waterjet-cutting machine, the company’s second, features a 6.5 by 13-ft. worktable and 60,000-psi pump. It’s a workhorse for the company, cutting primarily sanitary stainless-steel sheet and plate for conveyors and other handling equipment used in food-processing plants. Abrasive-waterjet cutting leaves a tapered edge, and the faster you cut the greater the V-shaped taper. 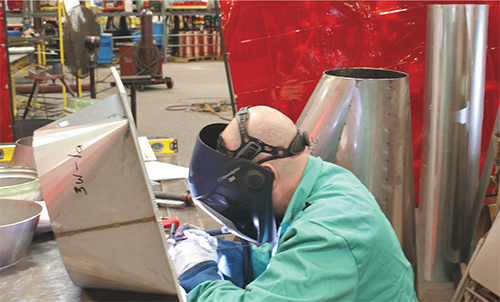 Traditionally, to compensate fabricators either have to slow down or make adjustments in weld-joint design or weld-prep steps, assuming that cut parts are to be welded. Wolfe’s perspective played out last year when the company found itself in the midst of rapid expansion, primarily due to growth in the food-processing arena. 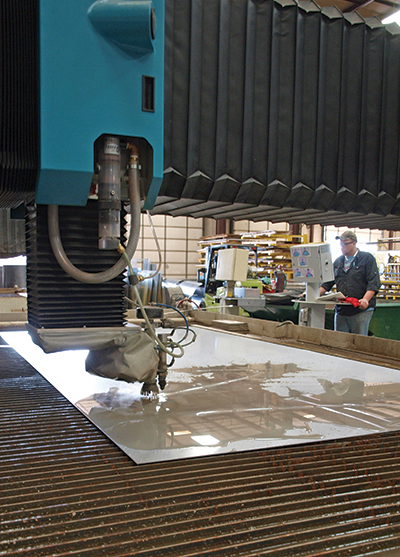 To meet increased demand for fabricated-sheetmetal products, the company had to find a sheet- and plate-cutting machine that would allow cut parts to move directly (or as quickly as possible) to downstream operations. Enter a new Flow Mach 3 machine (Model 4020b, with 6.5 by 13-ft. worktable and 60-ksi pump), brought in late in 2015 to work aside the company’s first waterjet-cutting machine. That’s also a Flow model, which has been a mainstay in the company’s 54,000-sq.-ft. shop since 2005. Wolfe’s expertise in stainless-steel fabrication includes gas-tungsten-arc welding. Here a welder works on waterjet-cut Type 304 stainless-steel ductwork (14-gauge sheet) and fittings (3⁄8-in. plate). In addition to fabricating and installing processing equipment, Wolfe also fabricates a range of air-handling equipment, including ductwork and piping. It operates a glass-bead-blast facility as well as an oversized paint booth. Wolfe’s new waterjet machine not only produces clean edges, it features Flow’s Dynamic Waterjet technology that does away with edge-taper concerns. The technology is based on mathematical modeling to predict taper angle, then compensating by adding the required wrist articulation. This action is managed by Flow’s FlowMaster Windows-based control system, based on user-input process parameters such as material type and thickness, cutting speed and desired angle quality. The cutting process, with edge-taper compensation, then occurs without intervention by a Wolfe programmer or operator. It pushes the taper to the scrap side of the workpiece to ensure a precise part-edge profile—four to six times more precise than a conventional waterjet, say Flow officials, with a much higher cutting speed. While nearly all of the projects undertaken at Wolfe Industrial are custom, here’s a repeat job it performs for a metal-powder atomizer. The three-piece assembly includes a copper-alloy furnace-nozzle insert fabricated from waterjet-cut 11-gauge sheet. Wolfe employs 25 in the shop and another 80 or so in the field working on installation and maintenance projects at several sites at any one time. It numbers 120 active customers and processes material from 26 gauge to 1.25 in. thick. As much as 80 percent of the material it cuts moves on to be formed and/or welded, and waterjet-cut work in particular rarely if ever requires any additional cleanup. Which Abrasive is Right for the Job? Wolfe feeds its waterjet-cutting machines a general-purpose alluvial-garnet abrasive (Barton 80 HPA, at about 1 lb./min. ), which “provides good edge quality and solid cutting performance,” says Barton literature. Also available to fabricators are more aggressive garnets for higher-speed applications and a more fine garnet that optimizes precision and generates the smallest possible kerf. How do you know which garnet abrasive best-fits the jobs at hand? Well, seemingly like every other sheetmetal-job-shop process, there’s an app for that. Check out the Barton Abrasive Value Calculator, available for iPhone and iPad, which generates a cost comparison of available garnets based on a bevy of parameters. These include cost, cutting speed and hourly shop rate. We saw several examples of the quality of the work coming off the new waterjet machine. 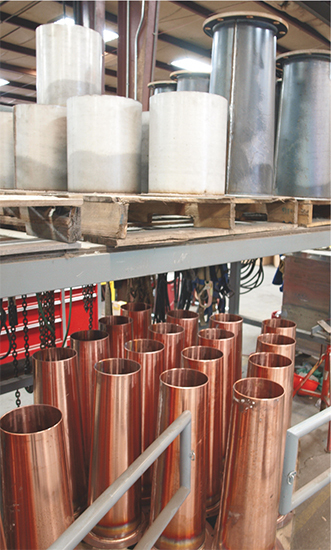 Included were parts being cut from Type 304 stainless-steel sheets (5 by 10 ft.) for fabricating chutes and ductwork for a General Mills food-processing plant; and copper inserts for furnace nozzles, fabricated for a company that gas-atomizes metal powder. See also: Flow International Corp. I was waiting for this form of issue. Thank you very much for the place.